Unfortunately, one’s own driving habits and responsibilities are not enough to negate any and all risks of the road. All it takes is for one other driver to lose focus, and an accident is just moments away. And with the increasing presence of technology constantly vying for our attention, drivers face more possible distractions than ever. Car accidents caused by distracted driving are a very real threat to drivers and pedestrians alike, and any instance of personal injury caused by negligence deserves full compensation. Our Salt Lake City law firm is committed to helping you prove the exact cause of your accident and injuries, thereby ensuring you are awarded the damages to which you are lawfully entitled. If you have been injured in a car crash that you believe was caused by a distracted driver, take a moment to learn the gravity of this offense and what legal recourse you can take. Cognitive distraction: Cognition refers to one’s thoughts and processing. If you are cognitively distracted, your mind may be elsewhere even when your hands are on the wheel and your eyes are on the road. In many cases, drivers can still drive safely while letting their thought roam; however, some drivers may be so caught up in their thoughts that they do not notice what’s in front of them or have slow reaction times. Listening to music or talking on the phone - even with a hand-free set - can be a cognitive distraction. Manual distraction: Manual distractions involve any situation in which the driver is physically removed from actively driving. This may involve reaching for something nearby, such as food or a device, or removing an article of clothing. Manual distractions are especially dangerous in bad weather, when drivers need to maintain careful control of the car. Visual distraction: A visual distraction pulls a driver’s attention and sight from the road. When drivers look at their phones or turn to speak with someone, they cannot adequately steer or react. It is estimated that one in four to five crashes are caused by at least some form of distraction. This means that, on average, nine people are killed and 1,153 are injured every single day due to a distracted driver. Unsurprisingly, cell phones play a significant role in these numbers. Texting while driving increases the risk of a crash by up to 23 times, drastically reducing reaction time and taking a driver’s eyes away from the road for an average of five seconds per text. Despite the fact that 94 percent of drivers are supportive of laws banning texting while driving, over a third of polled Americans have admitted to doing it. While recent laws and initiatives have shown some progress in select states, younger generations of drivers are not necessarily getting the message. 77 percent of teens and young adults claim that they can safely text while being the wheel, with 55 percent calling it “easy.” And yet, teens who text and drive spend roughly 10 percent of that time driving outside of their respective lane. If we are to take this threat seriously and protect those drivers who do follow the rules of road, distracted drivers who cause accidents should be held fully responsible for their actions. What Can Victims of Distracted Driving Do? After an accident, the injuries and property damage incurred may seem overwhelming even with insurance. However, victims of distracted driving should know that the law is on their side. 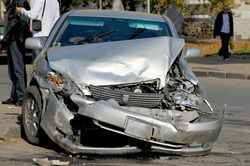 With an experienced personal injury and auto accident attorney, you can collect and present evidence to prove that another driver was negligent and therefore at fault. We will work with accident reconstruction professionals, speak with witnesses, consult law enforcement and medical professionals, and obtain the necessary physical evidence to show exactly what transpired at the time of your accident. Don’t leave your future to chance - call or email our office to ensure you have the right representation. Lynn C. Harris is committed to helping victims receive full compensation for their injuries, damaged property, lost wages, and other consequences of negligent drivers. For more information on how we can help you and what you can expect from our representation, call or email our office to schedule an appointment at your earliest convenience.